Quitting is indeed forever, but Tanya's Boyce is the antithesis of someone who would consider quitting. What she is instead, is the exemplification of bravery. Bravery comes in many forms, physical, emotional, in the form of having to change your course in life, to have faith that things will work out and to have faith that things will get better. When you're in a place you don't want to be, bravery comes in the form of strength. The mental strength of determination and even the physical strength of resilience. Sometimes to make things better it takes inspiration. But the strongest kind of inspiration and the most difficult to acquire, is the inspiration from within yourself. For someone who is in pain, in a dark place, you have to be able to inspire yourself to imagine what could be ahead of you, even when you are overcome by an all encompassing feeling of helplessness. But what make's Tanya so astonishing, is the incredible bravery, inspiration and physical resilience she produced to overcome an obstacle that would make most ordinary individuals fall to bits. But Tanya, has the mentality of an Olympic standard Pentathlete - determination, inspiration, adaptability and strength to deal with pain and put it somewhere else in your head in order to focus on achieving a goal. While at university, Tanya was on a training programme as a Pentathlete, at one of the UK's premier sporting universities, Bath. She was heading on a road for a spot on the British team for the Olympics. For those of you who are unfamiliar with the Pentathlon, in includes 5 events; Shooting, Swimming, Fencing, Equestrian and Cross Country Running. You need to be a naturally talented all round athlete to even think about becoming successful in the sport. So when Tanya started to experience difficulty in even just getting up, never mind training, out of the blue, she knew something was wrong. - She had developed Chronic Fatigue Syndrome. Sometimes you just get lucky with a GP or Consultant, they're not all the same standard. Thankfully for Tanya, she did get lucky and her amazing GP referred her to brilliant Sports Medicine Specialist, who rather than just writing a report on her, saw her every week for 6 months. But what she was told, took outstanding bravery to commit to. She was told: "This might not work, it's going to be painful, but it's your only chance. What do you want to do?" What she did, was grab it with both hands, overcome, enormous physical pain and depression and it did work. She seems to have approached her treatment like a gold medal winning Olympic Athlete. She is disciplined, works hard on her work / life balance, eats the right things and exercises regularly. Next time you go out on your morning run or cycle or play sport and start to feel the lactic acid kick in, spare a thought for what this incredible woman goes through. When I met Tanya, while training for my Sports Therapy qualification, she seemed the kind of person who embraces life, she was friendly, didn't judge and was just inspiring. When I go through the routine of carrying my Hockey Goalkeeper bag the long walk to training, I don't just think of people with far worse Epilepsy, I think of Tanya and what she went through. It makes me think to myself "Get a grip Katie". There are some people who make you feel humble to be in their presence and she is one of the few people I've met that has made me feel that way. - It was a privilege by the way Tanya. Tanya told me she was asked something once - "Did she regret anything that happened or feel bitter about it?" "In a word – no. Whilst it would be wonderful to be fighting for a 2012 place I wouldn’t have met my finace, be doing the youth work I now love or have met some of the amazing people that have helped and supported me along the way. Some of my closest and most important friendships have come out of the hardest of my times. I’ve learnt so much about myself in the journey and want to carry on learning." It's true, as the quote goes, "the most important relationship is you have is the one with yourself". If you learn about yourself, you learn how you can be at your best and you can learn how to improve when you're not. Tanya is far to intelligent for me to argue with, so I'm going to take her advice and keep on learning. That amazing insight will I know help me and I'm sure it will help anyone like us, who has a hidden disability like Epilepsy or Chronic Fatigue Syndrome. "If Carlsberg made role models, they'd probably be Tanya Boyce." Alex Staniforth isn't your usual teenager, he's not even average by normal standards, his story is extraordinary. Every now and again you come across people like Alex - modest, enthusiastic, caring, successful, but most of all, someone who would just say: "How can I help?" That is why, deservedly, he is going to be carrying the Olympic Flame near his home in Kelsall on the 29th of May. At 16, Alex has achieved more in his short life, than most people do in their lifetime. But it was not easy for him and what he has overcome and what he overcomes on a day to day basis is remarkable in itself. Alex was diagnosed with Epilepsy aged 9 and although his seizures were infrequent, the hospital environment and the invasive testing he underwent, left a different type of scar to his confidence, than to one that might cause Epilepsy directly. Although maybe at the time, you may feel in control of outside influences age 9, as you grow up, you realise just how young and vulnerable someone that age is. Even after having his Epilepsy controlled through medication quickly after being diagnosed, he had to overcome anxiety and another huge obstacle for someone so young. After his first seizure as a toddler, Alex developed a stammer and speech blockages. Just looking at his GCSE results, would tell you Alex is an articulate and incredibly intelligent individual, but when you have to overcome what he does on a daily basis, it can be difficult for people to really see this. Particularly if you are, like Alex, 16 and aren't on the same intellectual level as peers who'd rather talk about girls, cars, gossip and engage in more shallow conversation. This didn't stop Alex expressing himself through his actions however - 10 GCSE's (9As and an A*), along with becoming a PADI qualified Scuba-diver, diving with Tiger Sharks and Paragliding, which was just the start of Alex's endeavours. When Alex lets his legs do the talking, he is unstoppable. He is an exceptional distance runner and climber. He also just happens to be a world record holder. At just 16, after organising everything himself, Alex became the youngest ever person to complete the National 3 Peaks Challenge, which involves climbing and descending the 3 highest mountains in Scotland, England and Wales, all in less than 24 hours. What he did however, was not just to raise the bar for young climbers, but raise a very substantial amount for charity - £1.7K to be precise. He told me recently, in regard to a 10km race, he just wanted to get somewhere near the top 5 - in the end he came 2nd overall! When speaking to him about it recently, he said: "My Epilepsy is very mild compared to some, but regardless - it just proves that nothing is impossible. Aim high." With regards to his stammer, well for some being interviewed on the BBC and on radio, would be an easy task, but again he overcame his fears and spoke so eloquently, you wouldn't have known he had a stammer at all, unless he had mentioned it to you beforehand. 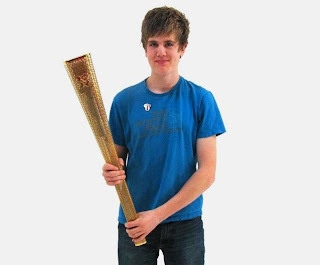 You can follow him on his blog: http://alexstaniforth2012.blogspot.co.uk/ and watch him not break a sweat, while carrying the Olympic Flame in Chester on the 29th of May 2012. So in the words of Alex, "Aim high" everyone, you just never know where you might end up. There is a mountain to climb with regards to overcoming Epilepsy, but Alex Staniforth, certainly isn't afraid to climb it. It might sound slightly odd, but in many ways I felt a sense of guilt for receiving things like my nomination and then conditional offer and now confirmation to carry the Olympic flame, this July as part of the London 2012 Olympics. I say that because so many people helped and inspired me to do what I did, that contributed to what I understand made up my nomination and they weren't recognised. I don't think of myself as someone who is inspiring, I just think of myself as someone who is lucky. I feel lucky to have had support and inspiration to get me through tough times in my life as well as motivate me to get up the painful hills in the RAAM. I feel incredibly lucky to have been afforded the opportunity to have surgery, which dramatically improved my Epilepsy. Even though I went through a tough period loosing my job as a Police Constable because my Epilepsy came back 5 years after surgery, I feel lucky to have had the support to get me through the period from my mum in particular. Most of all however, I feel so lucky that I found and latched on to sport. It was in the end, the making of me and has given me so much, particularly my cycling. When I got my letter from Coca-Cola saying "We've been searching for extraordinary people; those who have a burning passion and use it to spread happiness and inspire others. These are our future flames - and you are one of them", it was probably the most humble I have ever felt in my life. I will carry the Olympic flame on the 26th of July between somewhere between Camden and Westminster. Without a doubt I will be carrying the flame for Epilepsy, for all the people that inspired me and helped me and I desperately hope I can raise awareness of our condition by doing it. I've talked a lot about my experience with Epilepsy and Cycling, but I also talk a lot about people who inspire me and for good reason. I think it is time for me to tell their stories too, amazing idols of mine, close friends and people who do things that they think are unremarkable, that are actually exceptional. Without exception, I haven't met anyone with Epilepsy yet, who hasn't inspired me in some way. I now greatly look forward to telling you their incredible stories. As for me, well I hope to try and give back as much as I can to the people who helped me live a life which has been full and not a life wrapped in cotton wool. So my story is still ongoing and I'll keep you posted with any updates from time to time. Today is a fantastic day around the world for Epilepsy Awareness, but it is also a day of great privilege for me personally too. Earlier this morning, I was among a group that were the first people to climb Big Ben in Westminster that had Epilepsy. For far too long, there existed a health and safety rule that people with Epilepsy were not allowed to climb the landmark. It was a very special experience, not just because it is a unique experience in it's own right, to be standing a few metres away from Big Ben (which is actually the name of the huge hour bell, rather than the clock tower), when it went 10:00am and seeing the hammers that were making the noise that is so familiar round the world, but because of why I was there. I was there because I was asked by Epilepsy Action to attend the event, the Joint Epilepsy Council had organised to coincide with Purple Day and it was particularly special as someone who is somewhat a politics geek, to be with the first 2 known Epileptic MPs in UK Parliamentary history. It was also a privilege to climb with another Olympic Torchbearer with Epilepsy, Luke. The number of people I have met casually who will be representing Epilepsy in the Olympic Torch Relay is now half a dozen and I'm sure there are plenty more too hiding somewhere! (Please leave a message at the bottom introducing yourself if you are one of them). A little known fact too though, (which I only really pull out at group interview ice-breakers) is that the first time I ever voted in a Nation-wide Election, which was in 2008 - I voted for myself. Being the then President of Durham University's Labour Club at the time, I was asked to stand as a candidate. Done so that it would deter the BNP from putting up a candidate in our area, despite it being a stronghold of the opposition Liberal Democrat party. So to meet 2 inspirational MPs who were not only sitting members of parliament, but also incredibly active in trying to tackle the issues associated with Epilepsy was quite something. Of course it wasn't overly difficult for me to find clothing for today that had a dash of purple through it. Being a Durham University alumni, it's my university colours. I was a very proud Palatinate today, not just because I was wearing my university colours while representing my condition but also because of achievements of other Durham students new and old very recently. Durham had won a shed load of medals at the BUCS National Championships the other week. But on top of that, I had recently spoken to my old boss and Team Durham's Deputy Director, Quentin, who explained that there was 3 current students who would be Olympic Torchbearers, which is some achievement, even for a strong sport university like Durham. It was amazing to know that I was in good company after getting my confirmation letter last week saying I had been confirmed to carry the flame on the 26th of July. I somehow think there will be more than 4 of us though, we are rather expecting Durham alumni Jonathan Edwards to be carrying the flame too, but I have a feeling others like Andrew Strauss would be included also. The last couple of days have been a purple patch in general actually, meeting 2 other Coca-Cola Torchbearers on Sunday, which included Alex Staniforth who, as I mentioned before, you will hear more of soon. It was amazing even going round London and reminding myself of the wonderful Olympic landmarks there are, not to mention the climbing of an iconic landmark today. Tomorrow I'm looking forward to doing an interview for a rather big Cycling magazine, which I am very excited about and will update you on soon. In the meantime however, I couldn't resist taking a photo with my new Olympic Torchbearer themed polo shirt and my purple medical band I told you about in my last post, given I visited St Pancras International Station, where the Olympic rings are on display. I went with the second torchbearer I mentioned, who is soon to be the biggest star in the Philippines - Reymund Enteria. So thank-you to Reymund for the photo. I hope everyone had a great time raising awareness today - I'm off to paint the town, er..... PURPLE! There is nothing worse than being in limbo. It's difficult to say to someone you have Epilepsy, if you have a suspected diagnoses, or if you have been offered a new job, but haven't done the last little bit such as references or other checks. It felt like limbo a lot for me recently. I had a conditional offer for something, but it was so mind blowing and special to me, I was sure there was something that would go wrong with the security checks I had run against me. Even though I have never been in trouble with the police in my whole life - not even a rowdy house party as a teenager! 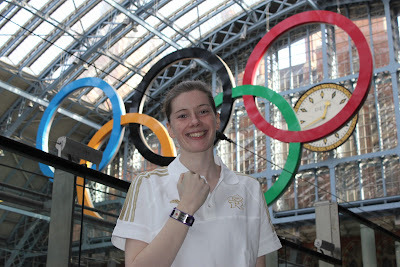 But it's amazing to say officially now, as of yesterday at 7:30am I am a Torchbearer for the London 2012 Olympics. I will carry the Olympic flame on the penultimate day of the 70 day torch relay in London. The reason for those of you who aren't regular blog readers or even don't know much about the flame, that it is so incredible, so humbling and such a privilege to be carrying it, is to do with what the flame itself symbolises. For me, sport changed my life for the better, I studied the sociology of sport at university, it allowed me to raise awareness of Epilepsy and it has been a sanctuary and a community for me. The Olympic movement is the poster child for all that is good about sport, it's motto encourages people to go faster, higher and stronger, but it's the Olympic flame which is the strongest symbol of the good sport can achieve. The Olympic flame is what calls on athletes across the world to lay down arms and come and compete in the Games. It is not only a symbol of sport but also of peace. The strongest emotions I had, when I received the official confirmation I would carry the Olympic flame, was just an incredible sense of privilege, it was hugely humbling. I felt that because the reason I completed the Race Across America, which was a large part of my nomination, was because I had the inspiration of friends that had Epilepsy spurring me on. I know so many truly inspirational people with Epilepsy and I can't help thinking "why me"? Unfortunately, due to the public purse, sponsorship is a huge thing for London 2012 and they are very strict on people wearing charity bands or corporate logos when running the relay. I will however be wearing my Medic Alert band as a safety precaution which I wear on my right hand, most likely the same side I will carry the torch on as I'm right handed. My medical band is purple - the colour of Epilepsy awareness. I haven't met anyone with Epilepsy yet who hasn't inspired me in some way and I want to feel I can have a symbol of that inspiration with me, when I carry the Olympic Torch. That inspiration will be my purple medical band I will be wearing which says: "KATHARINE FORD, DoB 04/04/86, EPILEPSY". - I will be proud to wear it on the day and don't feel in any way ashamed to be wearing something that has my name and my condition next to it, I just hope I can represent everyone with Epilepsy well. For most people with Epilepsy, regardless of what type of Epilepsy we have, there is one common worry that comes up over and over again. It's true that passing your driving test and getting a car is a right of passage for anyone in their late teens or even in life, that people make a statement through what car they drive, get a huge amount of freedom from not being limited by where they can go. It is a huge blow to anyone then, that you would know they won't have the chance to experience this freedom, or even worse experience it and have it taken away. You can't easily carry heavy luggage or personal belongings certain places, access remote areas or get somewhere as quickly as you would because of having to use public transport. I had my licence removed twice, I thought after my first seizure that took me out of the police that going 14 months clear could have meant that my seizure was a one off. Unfortunately it wasn't. But the thing about being in the driving seat in life, is that is doesn't necessarily involve a car. Taking control of your life that involves being in the driving seat, it not something which is related to milestones, it's not related to other's milestones, it's about an individual understanding what they are capable of and seizing it. People with Epilepsy have very individual experiences of the condition, some are severe, some involve a normal life with medication, some even involve a normal life after surgery. So how you take control is different, but each individual achievement can be incredible. For some just being employed, could more of an achievement than a non-disabled person running a marathon. You don't need to be an Olympian to have achieved something great. But the spectrum of Epilepsy remains the same, it can be severe, it can be very mild or even controlled. But like the technology constantly changing in cars, it constantly changes in Neurology too. I never thought when I was younger that my Epilepsy would be controlled, but here I am 22 years later and seizure free for almost 2 years. The good news is that research into cures for different kinds of Epilepsy are so fast moving, it makes the car industry look like a snail standing next to Usain Bolt. One thing people don't always think about is that, cars can be a drain too rather than a help. Having a Freedom Pass in London allows people with Epilepsy to travel through the city for free. A drastic contrast to able bodied people who may be stuck in traffic, after buying their car, tax disk, insurance and petrol at an ever increasing price. This unfortunately is not the same across the board and is not as well provided for in much of the rest of the UK, but I believe we will get to a point where it is, as well as developing new research into Epilepsy cures. That's a destination you don't need a car to be in the driving seat to reach, you reach it by working together to campaign, to raise awareness and raise funds for new research and progress. I recently encountered a girl in her late teens during an event for a common cause we had to do with. She wasn't exactly open to being in my company and was closed off and derogatory to me after only speaking to me for a couple of hours the day before when we first met. I was told that I had annoyed her for things that I think most people wouldn't have batted an eyelid at, but I put it down to experience, because I didn't fully know if she had a hidden disability like me. The next day however I found myself being accused of lies and found slanderous comments on my facebook account. It was interesting speaking to her about it though, the way she explained her actions. Ironically the reason she was getting recognition was for campaigning on anti-bullying. It goes to show that some people aren't as aware of how they come across as they think they are. I guess she was young and I'm certainly old and ugly enough to let if brush over me. I'm sure she will mature and go on to prosper in her own life. Despite my Epilepsy not being a factor in this particular case, it made me think in hindsight, what a freeing place spending time in the Epilepsy community is. One of the major issues with Epilepsy is bullying, because your seizures don't look normal, because you may have less energy than other people because of medication, or even that actually the lack in concentration that people with Epilepsy suffer has an effect on how they pick up information. In a lot of cases this is a verbal issue simply resulting in social cues being missed. I have learnt over a number of years to adapt to the issues I've had with remembering information about people. Even something as simple as not recalling a previous conversation means that it used to be a lot harder for me to form bonds with people socially. I'm not totally perfect now, but thankfully being self aware about the fact I have a weakness in a certain area has helped a lot in more recent years. The great thing about two of my best friends is that because the three of us have Epilepsy, we understand each other's quirks and forgive each other for wittering on about things, or tend to laugh about they way we are instead of worrying about it. It's incredibly freeing to have your friends that you can be completely yourself around and not have to compensate for your Epilepsy, or any other trait or impairment you might have. It's a sanctuary of sorts that I can go to whenever I need support too. Every cloud has a silver lining however, for me it was a rather positive effect on my life in work and in particular in business development. I found because I spent so much time studying how social cues worked and how peoples behaviour changed in different social scenarios, I was able to work out quickly who was influential in a room, who was worth speaking to and who wasn't. Curiously I found that actually speaking to a deputy, a husband or wife or a close colleague of a CEO or Director for example, rather than those individuals themselves was far more powerful. It worked because everyone flocked to one individual, so he or she had been given so much information they couldn't digest it. Speaking to those around them however allowed me more time to build a rapport, their guard wasn't up unlike their partner or colleague. As a result after all the information overload immediately experienced by the more obviously influential individual got lost, they would converse about an event or evening with their partner or colleague later, under calmer circumstances and my message got across. Like me they behaved differently in certain social situations and had a sanctuary where they were totally open with certain individuals in their lives. It just shows too, that actually disability can sometimes result in ability, even if it's by accident. I think if you understand someone you can forgive particular traits they have. If you experience those traits too, you develop a bond that frees you from normal daily life and it's restrictions, it becomes a place where you can let your guard down and be yourself.